This is one of those essential books borne of necessity and urgency. 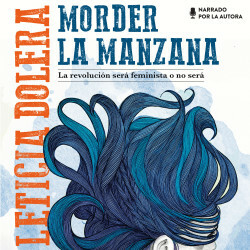 Leticia Dolera needs to tell us why she is a feminist and why all of us should be one. A life path that has brought her into contact with inspiring people, revealing readings, stories of experiences – good, bad, and worse – lived through by the author herself, or by those close to her. This book is also the story of brave women who marked out a new trail, whose example helps us to awaken our conscience and also to teach younger people. Starting with Eve, the first one to bite the apple, this is a story about all women. Because Leticia Dolera invites us to embrace a cause, one shared by all of us who dream of a just society. No matter how many times it’s been repeated that Eve sinned when she bit the apple, we know that doing so was the thing that made her wise. So what then? Do you feel like a bite? A work of feminist empowerment for all ages. The revolution will be feminist or it won’t be at all.